By Jeremy Daggett on March 21, 2013	in Dianne Feinstein, Gun Control, Gun Rights, Ted Cruz. Permalink. Senator Cruz framed the question in the opposite way from which it was answered. He wants to know if it’s permissible to positively single out individuals or things for which the rights enumerated in the Bill of Rights apply. 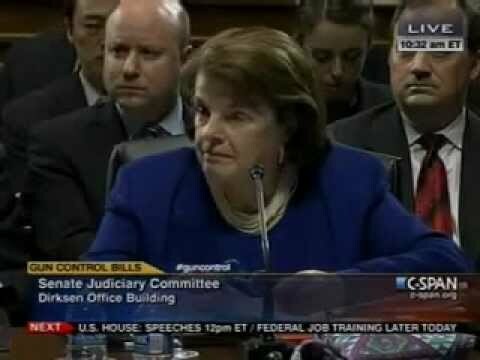 Senator Feinstein (and senators around her) wanted to say that we negatively identify certain individuals or things for which the rights in the Bill of Rights do not apply. But that is an answer to a different question. The question isn’t, “Are there exceptions to the Bill of Rights?” but rather, “May we identify a certain number or group of people or things and say that these are the only people or things which have protection under the Bill of Rights, such that even if there are twenty individuals who are identical regarding their legal standing as American citizens, Congress may decree that only one of them has the right to protection from unwarranted search and seizure?” The implication is obviously that the other citizens do not have that right, but the new decree need not specify that. Another layer is peeled back when we note Sen. Feinstein’s statement that “we just make laws and if the courts strike them down, then fine.” That is an interesting view on governing. Is she about defending the Constitution, which she has pledged to do in her oath of office, or seeing what she can slip past it? This back-an-forth also reveals her view that the Government is what gives us our rights—or at least that is what is implicit in her approach. She may not explicitly believe that and may even deny such a claim. But we often hold contradictory views without even realizing it. This may be one such moment for the Senator. But given the fact that many of us are legal positivists, I have my doubts about what degree of cognitive dissonance she may be experiencing. However, Feinstein’s guns ablaze tactic for gun control appears to have frightened off fellow Democrats who come from Purple States and are facing reelection.